For devotees of historical sea stories who still mourn the passing of Patrick O’Brian two decades on, you may now fill some of that void. 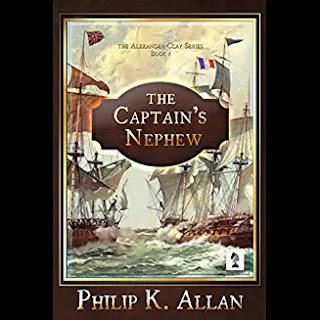 Philip K. Allan launches his “Alexander Clay Series” with a cracking good sea tale, The Captain’s Nephew. Allan brings all of O’Brian’s precise narrative style, attention to detail, immense maritime knowledge, and dense research—but with blessedly less nautical arcana and obscure Latin. Rather, Allan’s writing is accessible and goes down with satisfying ease. Woven from the Napoleonic era naval exploits of the self-made Lieutenant Alexander Clay, Allan’s first volume centers on a roiling grievance justifiably felt by Lieutenant Clay against his commander who displays at every turn unfair preference for a more junior officer who happens to be (the eponymous) captain’s nephew. There’s a tantalizing nascent love interest with a rich and orphaned young woman Clay meets as she is en route to India with her aunt and uncle. And of course, there is a clutch of ripping good sea battles and chases, reaching a climax in a lushly written fight between Clay’s speedier Agrius and the larger and more heavily armed French warship, Courageuse. Allan tacks to his own unique point of sail, avoiding anything formulaic or derivative by developing compelling characters among the ratings as well as the officers—what he describes as “Downton Abbey on a ship” in his author note. Clay’s nemesis in this volume, Captain Follett, is arrogant, entitled, and prejudiced against those he considers his inferiors (like Clay), but encompasses admirable qualities, too. Alexander Clay is unsurprisingly courageous, but he suffers from both a seething resentment of those better connected and the deadly sin of pride. This leads to some questionable choices that offer the promise of an interesting unpredictability in Allan’s hero for the volumes to come. The book—and, I anticipate, the series—is awash in both pride and prejudice. The author writes with admirable precision and fluency. His plot construction and narrative flow are tight and compelling, never losing momentum. His period-appropriate voice is unwavering, with that delicious High Tory tone and cadence that we Americans find irresistible. Penmore Press does yeoman service with cover design, copy editing, and formatting. From time to time, the author could trust his readers a little more, allowing him to prevent a few of his descriptive explanations from slipping into lecturing. This does not detract in any appreciable way from the enjoyment of this read, however, and I expect Mr. Allan will work through this minor defect as he progresses through his series and develops further as a writer.